Although there are quite a few note-taking applications to choose from, we'll show you why NoteCase and NoteFinder should be at the top of your list. Note-taking applications often are considered to be just glorified text editors. True – you can use a text editor to jot notes, but you need something more powerful if you want to format, organize, search, and export the stuff you write. Although you have quite a few applications to choose from, NoteCase and NoteFinder should be at the top of your list if you are in the market for a solid note-taking tool. When you first visit NoteCase's website , you'll notice an impressive array of supported platforms. 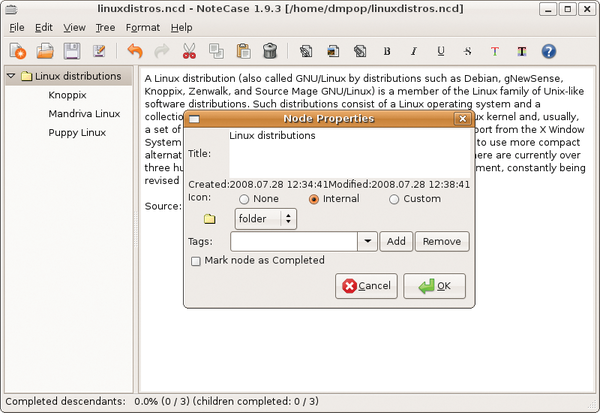 NoteCase runs not only on Linux, Free BSD, Mac OS X, and Windows, but also on Sharp Zaurus PDA and Maemo-based devices like Nokia N800 and N810 Internet tablets. Of course, NoteCase is available in the software repositories of almost every popular Linux distribution, but if you prefer to install the newest version of NoteCase, you might want to get the latest binary package from the application's download page, where you can find packages for Ubuntu, Fedora, and PCLinuxOS. Even a .deb package has been created specifically for Asus Eee PC. NoteCase's interface is simplicity itself, with a tree pane on the left, an editing area on the right, and an obligatory toolbar at the top. But don't let its appearance fool you – the application packs a lot of features essential for efficient note taking. NoteCase is a so-called hierarchical note manager, which means that it organizes notes into a tree structure consisting of nodes and sub-nodes. This provides a rather powerful and flexible mechanism for organizing and managing notes. Basically, it allows you to split notes into nodes and treat them as separate items. Each NoteCase document – or notebook – can contain an unlimited number of nodes and sub-nodes, and you can add them by choosing either the Insert Node or Insert Child Node commands from the Tree menu. Nodes and sub-nodes can be rearranged by drag and drop or via the available commands in the Tree | Move Nodes menu. NoteCase also lets you sort nodes and sub-nodes quickly. To do this, go to Tree | Sort and choose the desired sorting command. To tweak the properties of a node, right-click on it and select Node Properties. In the Node Properties window, you can assign an icon and add one or several tags to the node (Figure 1). To do the latter, type the tag's name in the Tags field and press Add. Figure 1: In the Node Properties window, you can add tags and assign icons to nodes. To add an icon to the note, click on the Internal radio button and select the desired icon from the drop-down list. If you don't like the default icons, the Custom option allows you to select icons in any supported graphics format, including PNG, GIF, JPG, and ICO. If you already have notes created with another application, you can import them into NoteCase using the File | Import command. NoteCase supports files created with the GJots2 and StickNotes tools. Better yet, the application can handle mindmaps in MM format, so you can import maps created with the FreeMind mind-mapping tool as a NoteCase notebook. When it comes to text editing, NoteCase offers all the text-formatting options you would expect from a decent note-taking tool. The application supports bold, italic, underline, and strikethrough text styles and custom colors for both text and background, and the Insert Picture feature lets you insert and scale images. All images are stored in the notebook file, which makes it easier to move the notebook between different machines. Using the Link Wizard in NoteCase, you can insert links to external websites and files as well as existing nodes. If you press the Link Wizard button in the main toolbar and select the type from the Link type drop-down list, you can specify the desired URL or a path to the file in the Target file or URL field or select the node you want from the Target node drop-down list. Instead of linking to an external file, you can use the Node Attachments button and attach a document or file to a node. You can add as many files as you want, and like images, all attachments are saved inside the notebook. This means that you can attach, for example, a Writer document to a node and send the entire notebook to another user. The recipient can then extract the attached document by selecting it in the Node Attachments window and pressing the Save to file button. NoteCase sports a rather powerful word count feature (see Figure 2), which can come in handy if you are using it to draft articles or book chapters. If you choose View | Calculate Word Count, NoteCase will display detailed statistics, including the number of words, lines, and characters in the current node, as well as totals for all nodes in the notebook. 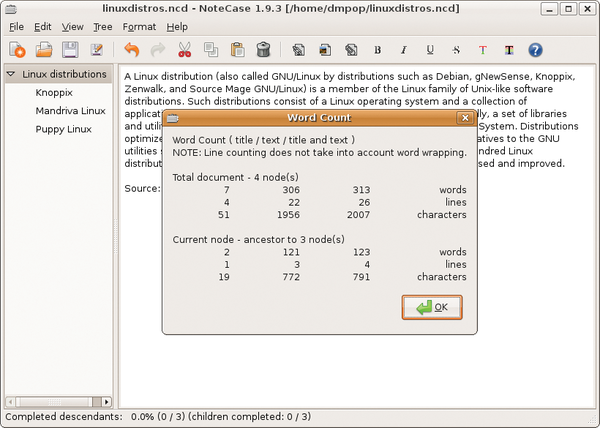 Figure 2: NoteCase offers a powerful word count feature. The Find feature allows you to search for text in nodes or for nodes containing specific tags, whereas the Edit | Replace command can come in handy when you need to search and replace a text string in the existing nodes. NoteCase saves notebooks as HTML-based .ncd files, so you can view any NoteCase notebook in a browser, which can be useful if you need to view one on a machine without NoteCase installed. Using the Export feature, you can save the entire notebook or just specific nodes in different formats, including HTML and plain text. And if the notebook contains confidential information, you can save it as an encrypted .nce file. The hierarchical nature of NoteCase requires that you structure your notes. If you consider that a drawback, and if you prefer to keep tabs on your notes without thinking in terms of nodes and sub-nodes, then NoteFinder  might be for you. This note-taking application offers a few nifty tools that let you create richly formatted notes and keep tabs on them. To run, NoteFinder requires Python 2.5, Qt 4.4, and PyQt 4.4. Python is installed on most Linux distributions by default, so you only have to take care of the other two packages. To launch the application, use the NoteFinder command. At first glance, NoteFinder doesn't look anything like a note-taking tool. With its calendar pane, NoteFinder looks more like a scheduling application (Figure 3); however, the calendar plays an important role in keeping tabs on notes stored in the application, which I'll cover in more detail later. 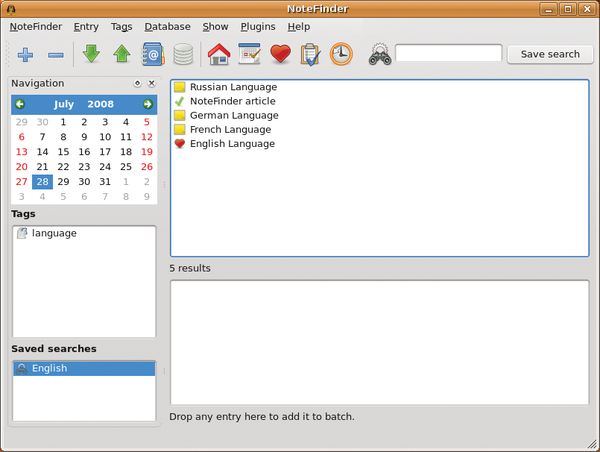 Figure 3: NoteFinder's main window. To start, you must create a blank notebook with the NoteFinder | Notebooks command. In the Notebooks window, you can add as many notebooks as you like. After you've created a notebook, you can start populating it with notes by pressing the Add button in the main toolbar. This opens the Editor window in which you write the note, format it, and tag it. The editing area contains two sections: the Wiki Source section is where you enter and format the text, and the Rich Text section displays the final result (Figure 4). Figure 4: Rich text formatting in NoteFinder is done with the Creole wiki markup. NoteFinder uses Creole wiki markup  for rich text formatting, and the toolbar in the Wiki Source provides quick access to often-used formatting options. However, NoteFinder supports other Creole formatting options, too, including bulleted lists, headlines, and links. Check the Creole website for more information. When you add a tag or tags to the note, they automatically appear in the Tags pane in the main window, and you can locate notes that contain a particular tag quickly by simply selecting it from the tag list. Every note you create in NoteFinder is attached to the creation date, and this is where the calendar comes into the picture. Click on any date, and you will see all the notes created on that date. NoteFinder also sports a handy search feature. If you enter the search term in the Search field, NoteFinder displays the matching notes, narrowing the results as you're typing. Pressing the Save search button adds the search to the Saved Searches pane, so you can perform it later by clicking on it. Also, you can bookmark notes and view them by pressing the Favorites button. Finally, you can add any note to the Batch pane by dragging and dropping or by pressing the Add to batch button. When it comes to exporting, you can save the entire NoteFinder database as a single package (Figure 5), create backups, or move notes between different machines. 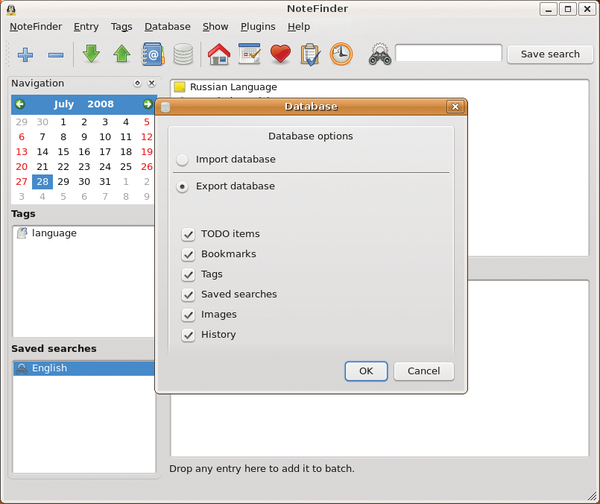 Figure 5: With NoteFinder, you export the entire NoteFinder database as a single package. NoteFinder also comes with a few plugins that let you save the currently selected notes as an HTML page (Plugins | Export entry to HTML) or turn the notebook into a set of web pages (Plugins | Web Notebook). A note-taking application is a must-have tool in your arsenal of productivity weaponry, and both utilities I've described in this article do a remarkable job of making the process of taking notes and keeping tabs on them as painless as possible. Choose the application that fits your needs best, and enjoy some stress-free note taking. Dmitri Popov holds a degree in Russian language and computer linguistics. 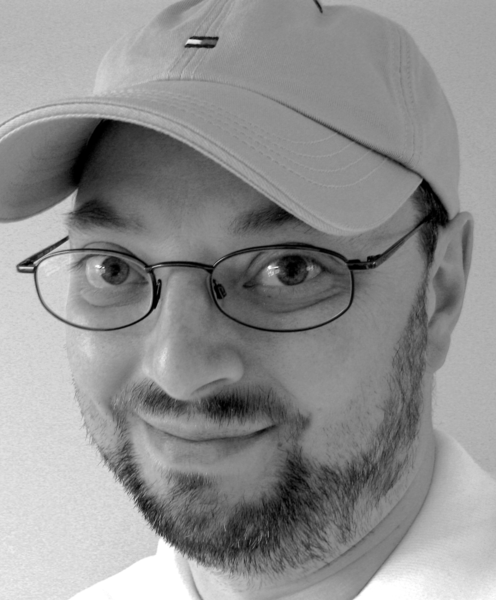 He has been writing exclusively about Linux and open source software for several years, and his articles have appeared in Danish, British, North American, German, and Russian magazines and websites. If you are looking for tools that are fast and don't take up too many resources, you ought to take a closer look at what Puppy Linux has to offer. Work smarter and faster using this hierarchical note-taking app that's packed with power user features. Sorting through the array of note-taking tools and their features can be overwhelming. We look at two applications that offer a simple approach.